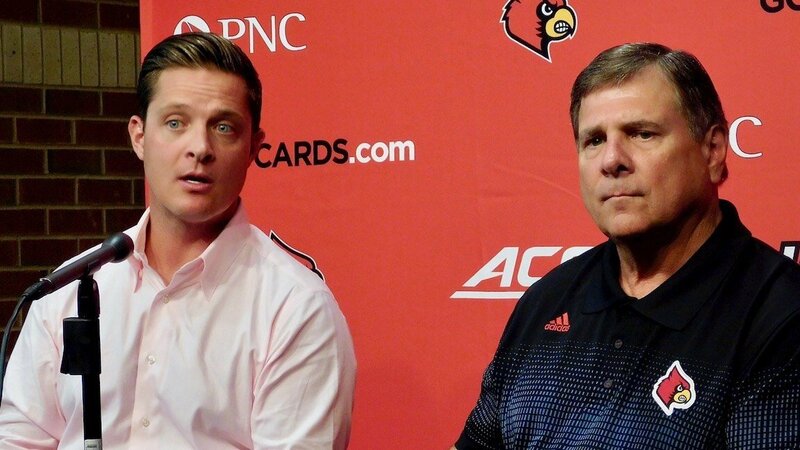 Tom Jurich was a master rule-bender during his UofL regime. A Courier-Journal investigation into his son, Mark, reveals exactly how the elder Jurich maneuvered around nepotism policies to help his son become the eighth-highest paid administrator in the school. In order to elude the university’s nepotism policy, Mark Jurich reported to either the UofL Foundation or the president’s office. We learned about this relationship quite some time ago. What we did not know is exactly how he got into this position in the first place. Mark Jurich spent four years as an intern before his father hired him as an assistant director of development over 63 other applicants. From that point forward, Mark’s salary came from different parts of the university to elude the nepotism clause. How did the different departments know how much to pay Mark? Mark’s salary increased often. The paper trail was spotty and many of the promotions were positions that did not have a vacancy. In other words, Tom Jurich created positions to give his son multiple raises. Read more about Jurich’s tactics in Danielle Lerner’s exceptional investigation for the Courier-Journal. Quite simply, organized crime and shameless government corruption. Sounds exactly like the organized crime family occupying the white house…although luckily for the Jurich family…none of them will end up prosecuted and sent to jail. Clearly not so with Kushner, Donnie, Ivanka, and maybe David Dennison himself. You mean Hillary and the Clinton Foundation? Lol! Probably the most crooked politicians EVER! You’re an IDIOT and lost your frigging mind!! No one is more crooked as the Clinton’s. Sounds to me you’re a SORE LOSER just as all the other Liberals!! Delray your an idiot. Do you think about Trump 24/7? Are you that upset he won you can’t function in everyday life without thinking about him? Your like a little bratty child. Catscats23, with you calling Delray an idiot, are you going for some kind of award or something? Because I surely would give you one if I had the power. BravoBravo Catscats. Sounds like another Sore loser!! Delray, you mean Fast & Furious and all that uranium given to Putin? And all the nuclear capabilities given to North Korea and all the pallets of cash given to the terrorist regime in Iran? UoL is a public entity, how are there not fraud / corruption charges being leveled? I have been thinking this since day 1. I don’t understand how Ramsey and Jurich aren’t under indictment. Finally a new super bowl story. Do I have your loyalty? You’re better than us in football, granted, but in bball you might be our Poulan Weedeater Bowl. That’s about it. Code’s arguments keep getting weaker and weaker, kinda like LittleBro basketball. Whoa nelly. Thought I was a Duke fan? I don’t care which you are, all I know is you’re not a Kentucky fan so stop pretending you care about our program. You do however prove KY ranks low in education. This is the way things work in the ACC, as DennyC calls it the REAL basketball conference…hilarious! Please, lets keep politics out of this. No reason to defame either the Clintons or the Trumps by using their names in the same sentence with the Ville’s family! Somewhere for the C-J, there’s an easy Pulitzer in re the ‘factivities’ of Jurich, Pitino, ‘university’ administration, et al, in re uavel’s corruption and decline. Oh, how The Don of UofL ruled. The city of Louisville got to be the dumbest city in America. Yum center deal, papa John stadium never filled original seating but 2 expansions that we’re never needed. Atheletic dept most revenue in all of the country lmao no one ever believed that what a joke. Little rinky dink school. How dumb are they…..
it truly is amazing how the city was bent over for UL. They will be paying for all these for many, many, many years.